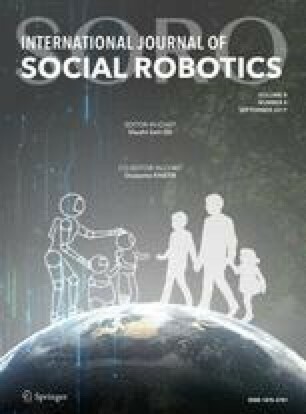 This two-part feasibility study evaluated the functionality and acceptability of Socially Animated Machine (SAM), a humanoid robotic monkey developed to elicit social interaction in children with Autism Spectrum Disorder (ASD). Socially Animated Machine was designed with an approachable, animal-like appearance, while preserving the essential features of a human face. The intent was to design a robot that would be interesting and engaging to children with ASD, yet maintain the capability to model facial expressions that convey emotional subtlety. Study 1 evaluated the accuracy of SAM’s emotional facial expressions. Typically developing children (\(N = 35\)) labeled and matched SAM’s expressions to photos of human expressions with moderate-to-substantial levels of agreement. Study 2 compared children’s level of social engagement across an interaction with SAM and an interaction with an adult experimenter. Children with ASD (\(N = 13\)) spent significantly more time attending to the partner’s face while interacting with SAM. When asked to rate their interaction with SAM, children with ASD reported high levels of happiness and comfort and requested additional interactions. These results suggest that SAM may serve as a useful tool in interventions to improve social skills, including emotion recognition, in children with ASD. The authors thank the Social Technology for Autism Research (STAR) Lab at the University of Alabama at Birmingham (UAB) and the children and families who participated in the study and made this research possible. This study was funded in part by a grant from Civitan International Research Center. This paper is adapted from the author’s master’s thesis. Funding This study was funded in part by a grant from Civitan International Research Center.